Thousands of books and only one of you. How do you choose? Books make great gifts for kids but with so many out there, you might be hesitant to dip into that pool. Thankfully, the folks at Disney Publishing Worldwide have let me review some great books that your kids will enjoy. 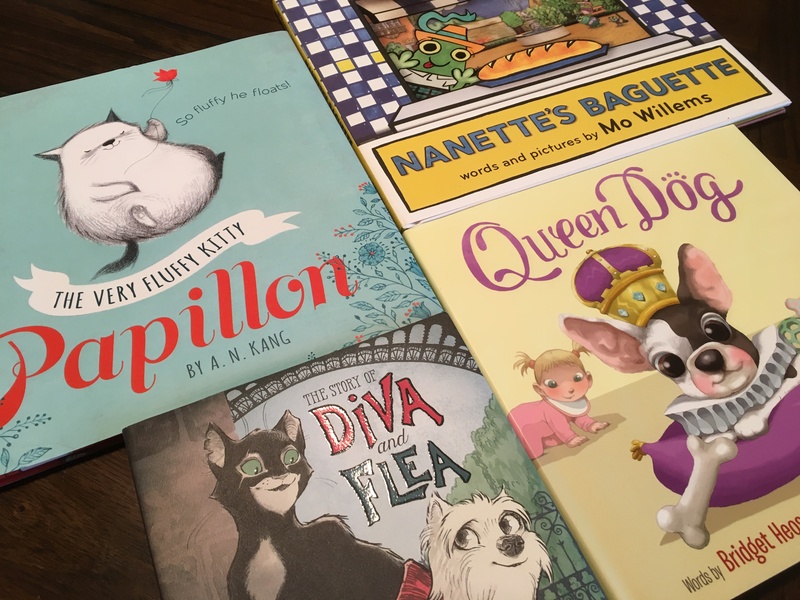 Because the scope of “kids books” covers everything from picture books to high school level reads, I’ve divided it into three categories with 3 books in each section plus an honorable mention in each category. Also, these are books I read in 2016. Some might have been published earlier but were so good I needed to share. Papillon – Loved this book. And like I said in the review, I’m not a cat lover. But it’s a very charming and adorable story about a kitty so lightweight, she floats. The art is reminiscent of classic Japanese manga type of art with fine lines and rounded figures. The story is simple but touching. Definitely enjoyable for all kids. Nanette’s Baguette – The rhythm of Mo Willems’ book is so perfectly paced it is practically palpitating with prose. I’m not Mo Willems, but I do love Mo’s use of words. This book in particular is super creative and fun to read. I was amazed to find out he actually BUILT the set for this book and combined traditional artwork with photography to create it. Awesome. The Story of Diva and Flea – Yes, that’s how good these books are. Mo Willems made not just one but two of the top three slots for picture books. Diva and Flea is a very different book than Nanette’s Baguette, but equally absorbing and appealing. The story is the cute relationship of a dog and cat from very different parts of Paris who happen to become friends. It’s such a great tale of learning from one another and the art is just beautiful and thoughtful. A must read. Honorable Mention: Queen Dog – It will almost definitely take one of the top honors next year, but since it isn’t officially released until 2017, it can’t be on this list. I was fortunate to receive an advance copy of this book that is so cute it will charm your pants off. A nice tale about accepting someone new into the family – from the dog’s point of view. Alice Through the Looking Glass: A Matter of Time – I haven’t read a good “Choose Your Own Adventure” style book for a long time, but when I saw this one, I knew I had found something special. Not only is this book’s outcome determined by the reader, but like you would expect from the Alice in Wonderland universe, sometimes you have to turn the book upside down to read it (not usually a good thing). It is so creative, colorful, and fun to read – and told from the viewpoint of four different characters including Alice. Dipper and Mabel and the Curse of the Time Pirate’s Treasure – Another “Choose Your Own Adventure” style book. Hard to believe two came out and that both would make it on the list! But this book which was done with contributions by series creator Alex Hirsch will delight fans of Gravity Falls who have been clamoring for more since the series ended after only two seasons. This book which is very much in the vein of the TV show has only “ONE TRUE ENDING” even though there are many different ones throughout. And then it ends with the cryptic, “But did you find a secret?” So good. 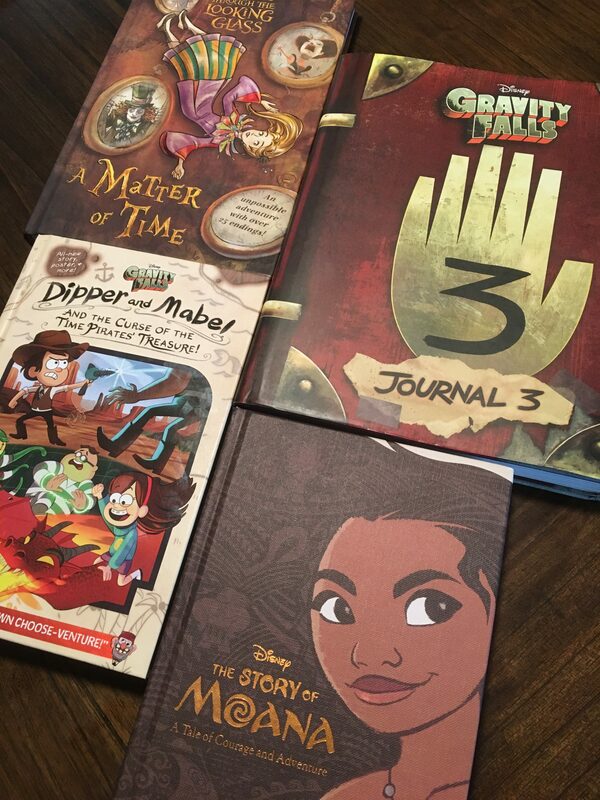 Journal 3 – Yes another Gravity Falls book! This one also appears on our top 5 Disney books list. It’s that good. Is it the best prose in the world? Probably not. But it is incredibly creative, clever, and highly satisfying for fans of the show. Alex Hirsch who created the series is also the author of the book and as such is able to give it more meaning and depth than anyone else. Filled with fun stories it also adds to the lore of Gravity Falls. If you like the show, you’ll love the book. Honorable Mention: The Story of Moana – I love this book and the creativity of how it was put together. It looks beautiful and adds to the lore of the movie. I haven’t finished it yet which is why it’s only on the honorable mention list, but it looks like a well done book and one that Moana fans will want in their possession. Probably for kids on the higher end of the age range. Young Adults (ages 12-18) – These books I relied on my daughter Emma to help me with. She’s read them (or at least most of them) and loved them. She is 12 years old and a voracious reader, so she has a vested interest in these novels. I’ve looked at all of them so I know they are appropriate for her age and judging by how much she enjoyed them, they are great recommendations. Midnight Thief – Kyra is a girl from the streets who gets involved with the Assassin’s Guild, but somehow ends up tangled with Tristam, one of the palace guards. They end up fighting together through danger. Through their ordeal, Kyra, who is an orphan who never knew where she came from, suddenly finds out who she is and has trouble handling it. Emma loved the twists and turns in the novel and already finished the second book as well. I’d Tell You I Love You, But Then I’d Have to Kill You – Part 1 of the Galllagher Girls series, this book is an empowering series for young women. The Gallagher Academy is a special training school for up and coming spies where they are taught skills like code breaking and martial arts. Cammie Morgan is a student at the school and this is her tale. Emma likes the books because of the spy aspect. She thinks it’s a great concept. A Whole New World – The beginning of the Twisted Tales series, this one features Aladdin and asks the central question, “What if Aladdin had never found the lamp?” In this story, Jafar gets the lamp first! My daughter loves the concept and the situations that result from it. She thinks it’s cool to see how the story unfolds from a different point of view. I think I’m going to have to read this series myself! Return to the Isle of the Lost – The sequel to the smash Disney Channel movie, this novel by Melissa de la Cruz is even better than the prequel she wrote to the first movie. Taking place between Descendants and the upcoming sequel, it sets the villain kids on a whole new adventure. The story flows easily and creatively deepens the characters you have grown to love. A great book for those who loved Descendants and a worthy follow up. Neither of us have quite finished the book yet, but Emma said she really enjoyed the story. Honorable Mention: Poor Unfortunate Soul – Disney keeps playing with alternate storytelling methods and here is another one. The third in a series of tales told from the villains point of view, you can guess who stars in this novel. Ursula tells the story of The Little Mermaid from her perspective. Again, this one looks so good, but just haven’t had time to read it yet (and neither has Emma! ), but wanted everyone to know about it. I hope you enjoy these selections and look forward to hearing your feedback. Do you have your own favorites? I would love to hear some of the books you’ve loved to read. Merry Christmas and Happy Holidays! As an adult, I enjoyed A Whole New World and A Tale As Old As Time. Whole New World stuck more to the Aladdin story then was different in the second half. Tale As Old As Time added a whole back story to Belle and Maurice and the kingdom that I thought was very interesting. I seriously need to read these myself. I know I would enjoy them too!